It is an extremely rare congenital defect, meaning it is present at birth. It is characterized by the complete absence of the external portion of the ear in an infant. It is sometimes mistaken for a similar condition named Microtia in which the ear is partially absent. A study performed between the years 1988 and 1992 showed that Anotia/Microtia occurred in 453 out of 3,246,408 live births. According to the statistics in this research, the condition has an incidence rate of 1.40 per 10,000 births. The exact factors responsible for the abnormality often remain unknown. Genetic mutation is sometimes suspected to disrupt the normal growth of the ears, resulting in Anotia. Despite the unknown trigger factor, the condition is supposed to occur from an abnormal or non development of the external ear during the fetal stage. The signals controlling the growth of the ear get mixed due to some factor and the ear fails to develop. Certain environmental factors may also be responsible for this irregularity. For example, women who use drugs like thalidomide have an increased risk of having a child with absent ears. Type IV Microtia is referred to as Anotia. 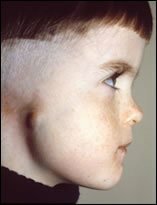 Complete absence of the ear is the main symptom of this type of congenital abnormality. In most cases, it is not possible to prevent the disorder due to its unknown etiology. However, avoiding the use of thalidomide during pregnancy can help lower the risk of having the condition for an unborn baby. The diagnosis can be confirmed by a proper physical examination. Sometimes, a child may complain of hearing loss after being diagnosed with this abnormality. It is important to evaluate the disorder as it helps with the detection of other associated dysfunctions. The gestation period lasting from 5 to 7 weeks is the most crucial time for the development of the fetus. It is also during this time that the fetus may develop certain thyroid dysfunctions that can disrupt the normal growth of the ears. Prenatal diagnosis can be performed to determine whether the fetus is developing properly. Diagnosing any congenital condition that can lead to this birth defect is more important than to check whether the ears of the fetus are developing properly. At present, patients can overcome the malformations of the ear through certain reconstructive techniques. However, it is not a mere aesthetic problem and affected children may experience various ear related disorders as well as deafness. In these cases, surgical correction can be a useful treatment option for managing the problem. During an operation, the auditory system of a patient is surgically enhanced and the malformed ear is reconstructed. A medical technique called auricular reconstruction is often used for curing this abnormality. It was first introduced during the 1930s. Since then, it has been regarded as a useful method for restoring the appearance of the external ear of sufferers. Parents of an affected child should consult a doctor to determine if this is the right treatment option for the patient. Bone Anchored Hearing Aid (BAHA) is an implantable apparatus which is very useful for this treatment. This hearing device is the only one to work through direct bone conduction. Patients suffering from an isolated type unilateral or bilateral Anotia can be successfully treated with this corrective surgery. The outcome of the condition differs from one child to another. Treating the disorder during the early childhood of patients helps to get a better outcome. It also helps children to deal with the abnormality and participate in normal social activities. However, surgical management of the abnormality does not generally result in any adverse effects in the normal development of a child. The following images show how the absent external ear affects the appearance of the affected children. Anotia requires early medical attention. Infants born with the disorder can lead a relatively normal life with proper treatment and follow-up.